Blue Mountain Lake, Labor Day weekend 2014. The spruce are dense above the lake. Margins the shore with heavy lines. Into the cool, reflected pines. Lost in the continual reflection. Unearthed and cast against the bank. Back from a Labor Day weekend in the Adirondacks (highly recommended, particularly including a little time on the water, and the Adirondack Museum). 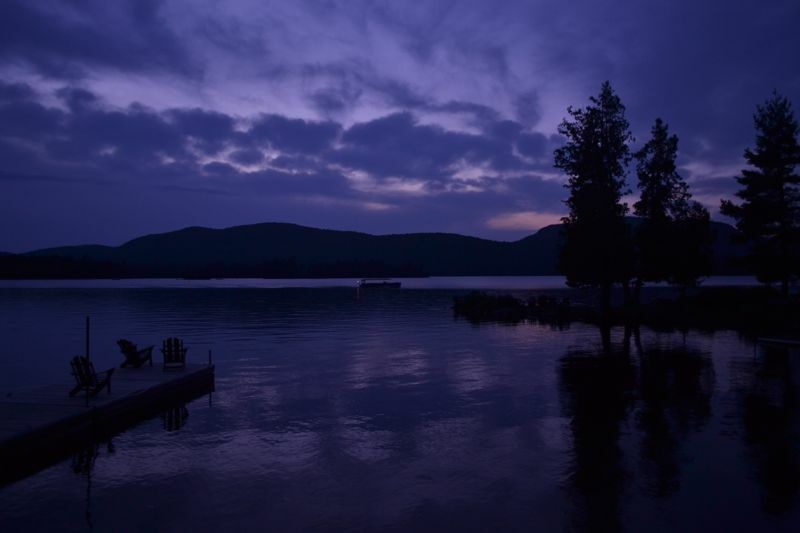 A selection from lots of photos I took, including–that deep blue one–the view from the porch of our lodge looking out onto Blue Mountain Lake on a late summer evening. To complete it, a bit from E.B. White’s 1941 essay, “Once More to the Lake.” He was talking about Maine, but the spirit is the same. Summertime, oh summertime, pattern of life indelible, the fade-proof lake, the woods unshatterable, the pasture with the sweetfern and the juniper forever and ever, summer without end; this was the background, and the life along the shore was the design, the cottages with their innocent and tranquil design, their tiny docks with the flagpole and the American flag floating against the white clouds in the blue sky, the little paths over the roots of the trees leading from camp to camp and the paths leading back to the outhouses and the can of lime for sprinkling, and at the souvenir counters at the store the miniature birch-bark canoes and the post cards that showed things looking a little better than they looked. This was the American family at play, escaping the city heat, wondering whether the newcomers at the camp at the head of the cove were “common” or “nice,” wondering whether it was true that the people who drove up for Sunday dinner at the farmhouse were turned away because there wasn’t enough chicken. Perhaps he seems a bit-old fashioned, even Norman Rockwell-esque now, but it’s hard to overestimate what an influence White’s prose had over Americans who tried to write a sentence in English in my generation. He’s still a lodestone to me.